The Marvel Universe has a problem and they are called the Inhumans. Okay, that’s slightly drastic — it’s not a huge problem, but it’s one that Marvel should fix: they are currently trying to put forward a slate of Inhumans comics, similar to their slate of Avengers comics or X-Men comics. Except most readers still don’t seem to be buying the Inhumans as a mainstream book — the books that are getting most praise are those books which have the least to do with the Royal Family (Ms. Marvel and Moon Girl and Devil Dinosaur). So how do you make a comic about the Royal Family both interesting to read and something which you can expand upon in a new line of comics? Well, here’s one idea. A lot of comics in Marvel are based on metaphorical concepts: the Fantastic Four are, metaphorically, a family (they are literally a family, too). The X-Men are an oppressed class of people who have metaphorically stood for various oppressed minorities over the years. 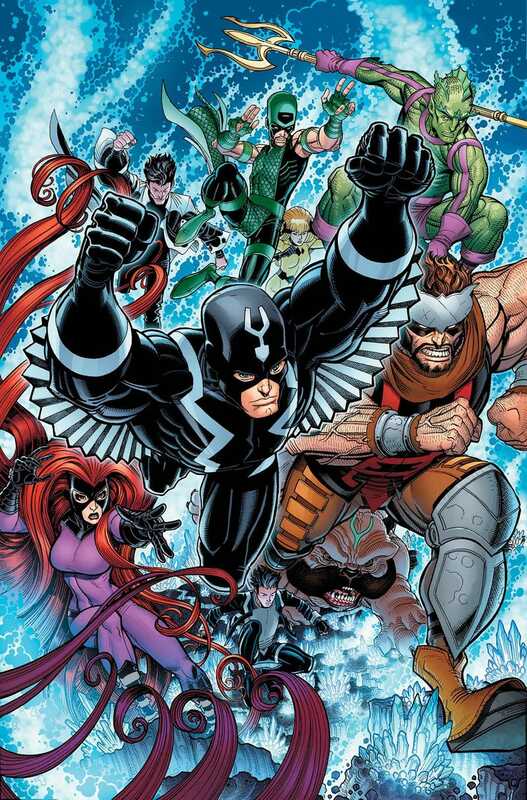 The Inhumans, with their strange body types and hidden kingdom, metaphorically stood for the Other, the social groups that are alienated from the “Us” of society. This is shown quite clearly during the Inhuman backup stories in Thor #146 to #152 (written by Stan Lee and drawn by Jack Kirby) in which Triton, one of the Inhumans, is caught by some fishermen and put in a circus-like display. The Inhumans are, well, inhuman and are often treated as such outside of their own society. However, they are also, paradoxically, royalty. They have a Royal Family (complete with a royal dog) and generally, their stories have been about the burdens of ruling, with the House of Agon (lead by King Black Bolt and Queen Medusa) continually thwarting the insane Maximus the Mad. In this case, the Inhumans are a royal soap opera when they keep to themselves. A twelve-part series that would re-establish both the roots of the Inhumans and put a path forward for their future. After whatever crossover happens with the X-Men (Inhumans vs X-Men), Medusa is left with an uneasy feeling as to the future of Inhumanity. They have lost a lot of their popularity with the public, even though there are more Nuhumans popping up every day. Finally, she has a vision of the “Breathkeeper,” an Inhuman god worshipped by ancient Inhumans long forgotten, who tells her that all Inhuman culture will be lost if they do not experience a “paradigm shift.” The Breathkeeper then tells her a secret that shakes her to the very core. Map of Attilan, on which Afterlife is based. The next day, she gathers all the Inhumans and Nuhumans in New Attilan, where she activates the engines and drives the city to their new land: the raised island of Afterlife. As the Inhumans and Nuhumans explore the newly raised island of Afterlife (complete with the Lost Tower of Wisdom, the Arena of Judgment, the Silent City, and Kree Sentry 1265 to protect the inhabitants), Medusa reveals to Black Bolt the secret that the Breathkeeper told her: long ago, the first Inhuman, Randac, made himself the first King of the Inhumans, but wanted more. So he conquered the world itself and created an Inhuman Empire that lasted for generations. There are no memories left of this Inhuman Empire, it was wiped from the face of the Earth, and all memories of Randac shown him only as benevolent, but he was only benevolent to other Inhumans. To humans, he was a tyrant king. She doesn’t know what happened to wipe away everyone’s memories, but she knows that the Inhuman Empire is both something that can happen again and must never happen again. Except now, with all the Nuhumans and the power they wield, it is inevitable one of them will try. “We are not a team, we are not a group of heroes trying to fight for justice or freedom. We are a society, a nation, not made of those who populate this world, but a people, ancient and invisible, who have lived and died in secret for millenia. We have made mistakes, yes, sometimes many of them, but we will not let them define us. Our nation has fractured, so now it is time to put it together. Once we lived among you, hidden, but we can be hidden no longer. We are not the people that you think we are. We are older and stranger. And we must fight, not only for the continued survival of ourselves, but for our culture and our way of life. If we do not, we will lose everything. She then tells Black Bolt that she made a deal with the Breathkeeper, the ancient Inhuman god of Death: he would raise Afterlife from the depths of the ocean where it sank thousands of years ago and, in exchange, she would be given one year to help the Inhumans, to change the Inhumans for good. One year and then Medusa would give her last breath over to the Breathkeeper. One year and Medusa would die. The rest of the series would follow not only Medusa as she worked to find ways to establish a new Inhuman nation and a new Parliament and to stop any Inhuman or Nuhuman threats, while Black Bolt works to somehow void her own contract with the ancient Inhuman gods (most of them nameless, faceless, and forgotten). And the US government wouldn’t like the fact that there’s suddenly a new island nation (with a giant Kree Sentry on it) and there would be a lot of Nuhumans who wouldn’t want to live there (like Ms. Marvel). And, of course, the ever present threat of the return of Maximus the Mad, who might have gone a little more insane this time. But there it would be. A giant royal soap opera with added mythology and a perfect metaphor for fading empire. For me, the new book would show the Inhumans as the last remaining remnants of a world-spanning empire that is now only trying to keep their culture intact in the face of a large scale population increase — i.e. the perfect metaphor for Britain and the British Royal Family (complete with royal dog). Add it some Game of Thrones-esque mythology, flashbacks, and action, and you get a new status quo for the Inhumans that could work perfectly to not only distinguish them from the X-Men, but also make things much more interesting and in tune with their prior appearances.